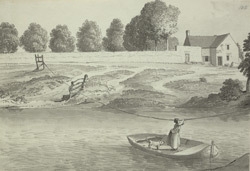 This sketch shows Butterby Ferry in the parish of St Oswald at Durham. The person wishing to cross the Wear at this point would stand in the centre of the boat and propel it across the water by moving their hands along the overhanging rope. Butterby was famous at the time for its mineral springs. In 1824, local historian George Allen wrote that "great numbers of persons frequent these wells to drink the water". Mining towards the end of the 19th century is supposed to have disturbed the flow of water to these springs and the immediate area remains unspoilt.